The Riddell SpeedFlex Youth Football Helmet is here and taking the football world by storm. 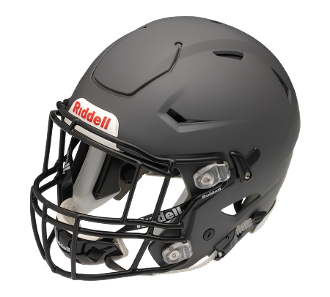 Complete with many of the same features as the Adult model, the Youth Speed Flex features Riddell patented technology designed to adapt to all of the hits a player faces on the gridiron. The aggressive shell design makes the player stand out and the Ratchet-Loc system locks the player in. Take the field with confidence knowing you are wearing the top youth helmet offered by the industry leader in football equipment. Demand the best and get your child in the Riddell SpeedFlex Youth Football Helmet! Composite Energy Management keeps interior helmet padding in place during physical activities. Total weight of 4.2 lbs including facemask and chinstrap. Attach and detach facemask made simple by All-points quick release system. Side impact force reduced by Patented Side Impact Protection (PSIP). A Flexible liner is used in order to increase comfort and stability due to varying head shapes. Adjusting your chinstrap has never been faster or simpler thanks to the Ratchet-Loc retention system.